The primary development-related ordinances of the City of Bryan are listed below. Click on the appropriate title to view and/or download the ordinance. All files are in PDF format. Please click here to download Acrobat Reader. To view all the current ordinances for the City of Bryan please visit the Municode.com webpage. In Bryan, it is estimated that 75 percent or more of the flooding occurrences in residential structures could have been avoided if the following provisions/ordinances in place today had been followed in the past. In addition, feedback from foundation repair contractors indicates that the No. 1 problem resulting in foundation failures is poor site drainage and yards that do not drain water away from the foundation. 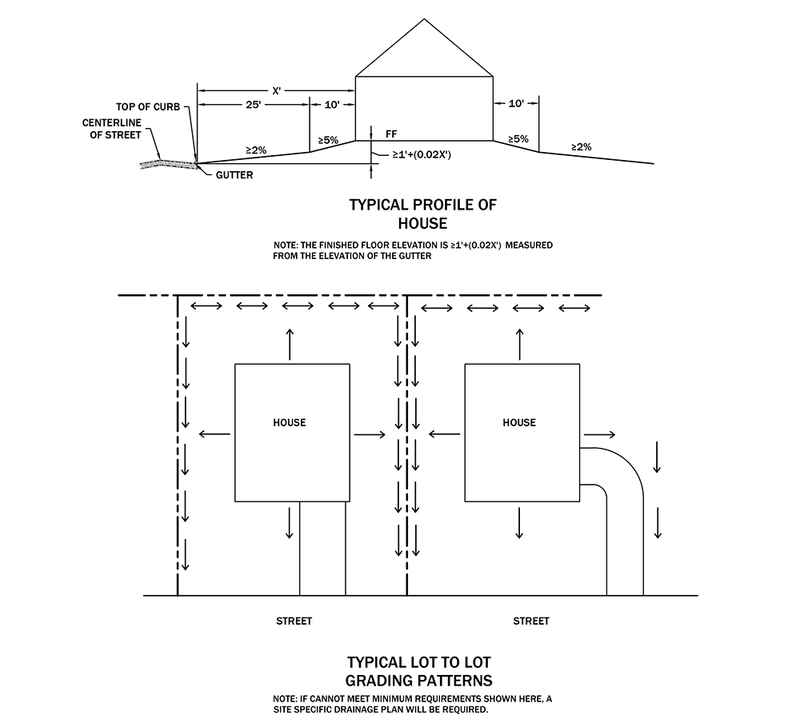 Here are requirements for residential lot development to reduce flooding of structures as it pertains to driveway construction, foundation construction, and final site grading. Adhering to these provisions will help reduce or eliminate structure flooding and foundation issues, and prevent water damage and insurance losses for homeowners. Have questions or need additional information? Please contact our Planning & Development Services at (979) 209-5030. Driveway elevation at property line is required to be as high as the top of curb or the center of the crown of the street (whichever is greatest). It is recommended that the elevation of driveway at the property line be an additional 6” greater for additional protection. Do not slope a driveway towards the house. Driveways should be sloped towards the street and/or yard that slopes away from the house. Lots are required be graded to drain surface water away from the foundation. Per 2015 IRC Section R401.3 “Drainage”: The grade shall fall a minimum of 6” within the first 10’. Drains or swales are required to be constructed in-between homes at adjacent property lines to insure drainage is routed away from all structures. Impervious surfaces such as driveways, patios, sidewalks, etc. should be sloped to drain a minimum of 2% away from the home’s foundation. Alternative elevations are permitted in special cases such as in hilly areas and where approved in advanced by the Building Official or City Engineering Department. When the above standards cannot be achieved due to site constraints, a drainage plan shall be submitted with the permit application and city approval must be obtained before construction or site work begins. Building Services is responsible for the issuance of permits for construction, vendors, solicitors, signs and garage sales. Building Services also performs building inspections prior to occupancy of structures, during construction/remodeling, and to determine whether structures are safe or if structures should be demolished per Dangerous Structures Ordinance. Do I need a permit? / ¿Necesito Obtener un Permiso? If you have any questions or need more information about the code updates or the adoption process, please contact Chief Building Official Greg Cox at (979) 209-5010 or email building@bryantx.gov. The 2014 National Electrical Code is now in effect for the City of Bryan. Building Plan Review is performed to ensure that proposed structures comply with all applicable federal, state, and local statutes, ordinances, and building codes in order to protect the health, safety, and welfare of the structure’s occupants. Information regarding the requirements and review times for various residential and commercial construction documents, as well as professional qualifications for architects and engineers and requirements for construction permits are listed below. Signs, Fences, Accessory Buildings, Carports, Etc. Completed permit application with description of work. Building inspections are required to ensure that construction is proceeding according to the submitted and approved development plans, and meets all current and applicable laws, ordinances, regulations, and building codes. It is the contractor’s responsibility to schedule all inspections by contact Building Services with the site address of the project and the type of inspection needed. Disclaimer: Below is the recommended sequence of building inspections for both residential and commercial construction. Although the Development Services department strongly encourages that builders and developers schedule inspections for their projects in the order listed below, we recognize that there will be exceptions. The actual sequence of inspections, excluding final inspections, will be determined by the specific phase(s) of construction completed at the time the inspection(s) is/are requested. A Slab or Foundation inspection is only performed after the Plumbing rough in, and a Building Frame Inspection is only performed after the other rough-in’s and the plumbing top out. The Building Final is always last (No exceptions). Again, all other inspections for a specific phase needs to be performed and passed before a Building Slab, Frame or Final can be performed. Inspection request received before 8:00 AM, Monday thru Friday, will be schedule the same day. Request received after 8:00 AM, Monday thru Friday, will be scheduled the following business day. This information is provided as a technical resource for engineering and architectural professionals for use in design and construction activities in the rights-of-way or easements. Design professionals assume responsibility for selection, reference, and appropriate application of these resources. These standard details can only be modified, when approved in advance, by the City Engineer, or an authorized representative. Persons making use of the information contained in these files shall be solely responsible for their use. These files are not intended as a substitute for the professional judgment of a design professional. Please click here to view the BCS Unified design guidelines.